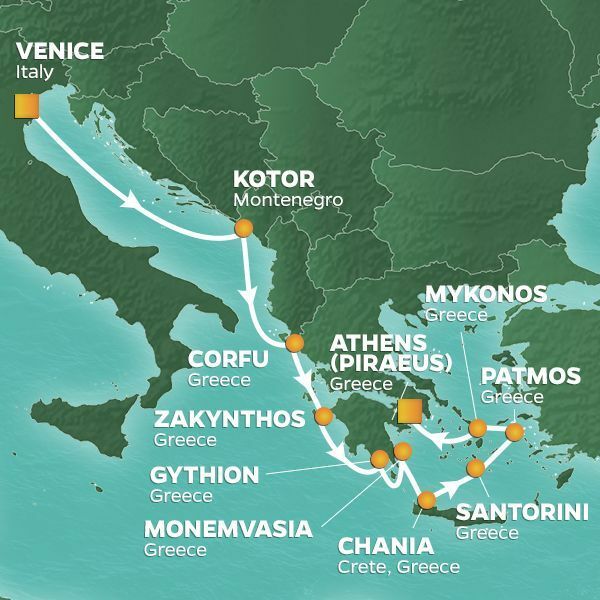 Complimentary, exclusive and unique Virtuoso Voyages event in Corfu. Click on Virtuoso Voyages tab for complete details. The gorgeous Ionian island of Corfu was part of the Venetian kingdom until the 17th century, when it passed to English rule, and shows fascinating foreign influence within its unmistakably Greek atmosphere. We'll get our bearings at the popular overlook spot of Kanoni, with views to Mouse Island and the pretty Convent of Vlacherna before transferring to Corfu Town, the elegant guardian of the region's history. We'll pass by the stately Mon Repos Palace, where Prince Philip was born in 1921, and stop at Garitsa Bay to admire the 16th-century Venetian Fortress and the church of Saint George, built by the British to look like an ancient Greek temple. We'll embark on a guided walking tour around the Old Town, a UNESCO World Heritage site, and see the enchanting Town Hall, a former Venetian theater dating to 1690, and the church of Saint Spyridon, home of the remains of Sypridon, the fourth-century patron saint of the island. We'll end in the lovely Liston arcade, a relic of a seven-year French occupation, and have some free time in town before heading to the seaside Paleokastritsa, known for six coves of incredibly clear water. A highlight here is the 13th-century monastery of the Virgin Mary and its garden. Suggested Attire/Walking Notes: Casual wear with comfortable walking shoes. Guests must be able to walk approximately 1 mile over even and uneven surfaces and inclines.